Radon is an odorless, colorless gas that is naturally released into the environment as a decay byproduct of radium. Radium is a decay byproduct of uranium which can be found in certain types of rock, soil, or water. Some areas have higher concentrations of radon due to the soil composition which leads to additional testing for radon. When radon gas decays, it forms radioactive particles that can get trapped in your lungs once inhaled. In fact, “Exposure to radon in the home is responsible for an estimated 21,000 lung cancer deaths in the U.S. each year” per the U.S. EPA. 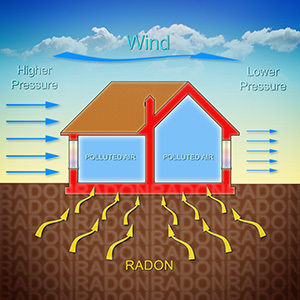 Because radon is typically found in the soil, it is most likely to diffuse from the soil into homes and buildings because of their lower concentration. This is very similar to how heat moves from a warm space into a cooler space. So, what can be done to protect our homes? Typically a radon inspection will occur to measure the levels of radon found in the space. Depending on the levels measured, a radon mitigation system may be installed. The most common type of radon mitigation system is a sub-slab depressurization or active soil depressurization system. These systems primarily use a vent pipe system in conjunction with a fan that pulls radon from beneath the house and vents it outside away from windows and other building openings. The fans used in radon mitigation systems are typically mounted outdoors, in a basement, or in an attic space to prevent noise nuisances from homeowners. Because of this, there is not an easy way to verify that your radon mitigation system (specifically the fan) is operating to exhaust radon. Released in 2018, Dwyer’s Air Flow Indicator and Alarm (Series DAFA) was designed with the homeowner in mind. 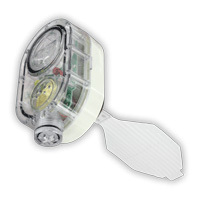 The DAFA is a low cost flow indicator and alarm designed to be used in conjunction with radon mitigation systems. 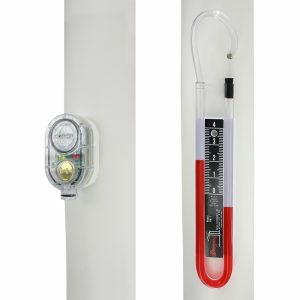 Typically, radon mitigation systems are installed with a U-Tube style manometer that the homeowner inspects to verify pressure changes in the mitigation system indicating fan operation. Frequently, the U-Tube manometers are mounted in the basement or the garage and are not frequently inspected by the homeowner. The Dwyer Air Flow Indicator and Alarm incorporates visual indication lights that indicate a “no flow condition,” meaning the fan is not operating correctly or a low battery indication. 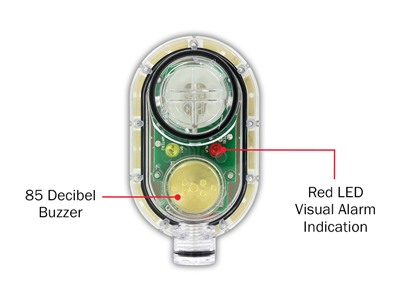 In addition to visual indication lights, the DAFA incorporates an 85dB alarm to warn of a no flow situation. The battery operated design with typical five year steady state life, allows for easy installation without the need for local power to operate the switch. The Dwyer Air Flow Alarm will give you the peace of mind that your radon mitigation system is operating effectively without requiring frequent inspections and checks to verify flow. 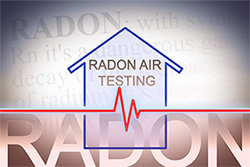 For additional information on radon and radon mitigation systems, please reference US EPA, Document 402-K-03-007; or EPA Document 402/K-13/002, Home Buyers and Sellers Guide to Radon. Previous PostPrevious Why Does the SMART Air Hood® Balancing Instrument Measure a Lower Flow than Traditional Air Flow Hoods?